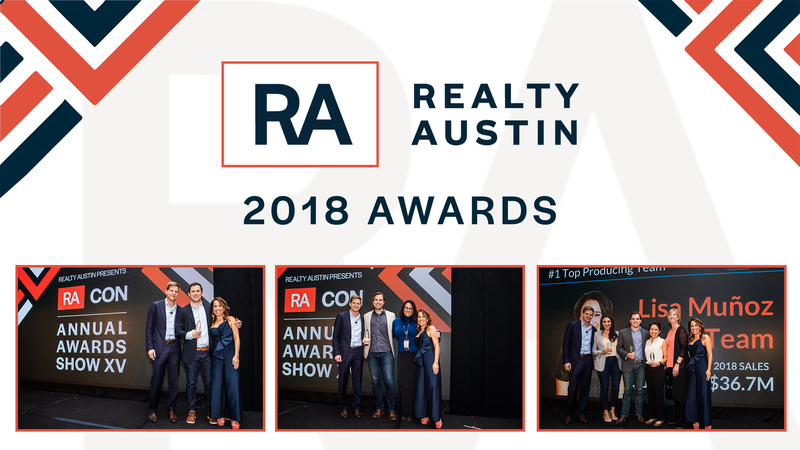 AUSTIN, TX – Realty Austin, the #1 independent residential real estate firm in Austin, honored its top real estate agents at the company’s annual awards ceremony. The brokerage of the future celebrated the achievements of their 465 rockstar agents and 34 support staff. Based on overall sales, Realty Austin’s no. 1 individual top producing agent Brian Copland was awarded top honors. Brian hit the ground running when he joined RA in 2012 and has been steadily increasing his year-over-year sales. Fast forward 6 years later, Brian is now a Ninja, perennial diamond clubber, a PT50 finalist and a proud father of 3. Realty Austin’s no. 2 individual top producing agent was Adam Walker. After joining Realty Austin in 2014, Adam coined the phrase, #shouldamadethemovesooner after doubling his business over 3 years. Realty Austin’s no. 3 top producer was Burt Dement with Chris Tinnell at no. 4, Allison Olson at no. 5, and Kelvin Glover coming in at no. 6. Aaron Nann was the no. 7 top producer with the top 10 closing out with Jeff Sehon at no. 8, Ashley Brinkman at no. 9, and Jen Berbas at no. 10. The no. 1 Top Producing team company-wide at Realty Austin was the Lisa Muñoz Team. Our original Ninja, the Lisa Muñoz Team has sold almost a QUARTER BILLION in real estate since joining Realty Austin in 2011. The no. 2 Top Producing team company-wide in 2018 was Joe and Cara Keenan, and no. 3 was the Gail and Ben Team. The Realty Austin Diamond Club is an exclusive group of agents who close over $10M and teams that closed over $15M in 2018. To put their qualifications in perspective only 3% of Realtors in Austin sold over $10M in real estate in 2018. Realty Austin has 60 of them. The Realty Austin Diamond Club honorees for 2018 are Lisa Muñoz Team, Brian Copland, Joe and Cara Keenan, Melissa Roberts, Gail and Ben Team, Adam Walker, Burt Dement, Chris Tinnell, Susan and Natalia Team, Kelvin Glover, Allison Olson, Lockie and Warren Ealy, Bryan and Rebecca Greenleaf, Aaron Nann, Jeff Sehon, Ashley Brinkman, Michael and Stacy Spickes, Jane and Erin Team, Jen Berbas, Sonny and Erin Bara, Cristina Valdés, Hubbard Team, Kate Hamlin, Jennifer Henry, Cynthia Mattiza Team, Maggie Falvey, Carlos Ojeda, Juanita Thornton, Art Fonseca, Yusuf Johnson, Kim Fry, Peter Van Kooij, Tony Elias, Haval Abbas, Charla Housson, Nick Easley, Sari Pearce, Alicia Kelley, Kim Wilkin, Angele Moyseos, Barrett Raven, Ami Davis, Fara Kosari, Kim Fodor, Kathleen Wainwright, Amy Mills, Mark Ponton, Sharon Murray, Zach Wallace, Sherry Hendrickson, Tracy Picone, Josh Lasserre, Susan deGraffenried, Alexia Dauterive, Kevin Knight, Kevin McCord, Matt Friedlander, Amy Gandy,Jon Chambers, Charles Runnels and Kelly and David Thate. Starting in 2019, Realty Austin introduced a new program to recognize agents who sell more than $6M and teams who sell more than $9M. This is no easy accomplishment as only 8% of the 13,000 ABOR members achieve $6M in sales each year! We are proud to recognize 100 agents into our Sapphire Circle. The Realty Austin Sapphire Circle honorees for 2018 are Ramirez Team, Amanda and Amy Team, Sarabeth and Jordan Team, Beverly M. Williams Team, Jeffrey and Gina Nyland, Hill Team, TLC Team, Michelle Hendrix, Gretchen Lynn Janzow, Salma Manzur, Ruth Powers, Jeremy Fisher, Darcy Newton, Alan Adams, Rick Rabon, Jéan Bruns, Laura Olesen, Ciccarelli Team, Jeffrey Schnabel, James Watson, Brooke Williamson, Jenny Walker, Todd Whelpley, Bob and Michaela Hachtel, Cathy Trifiro, Mark Kolbe, Jenny Rosas, Johnie Borgeson, Cory Culpepper, Sherry Ellenbogen, Rob Albertson, Grace Miralle-Wilkens, Moe Alsharif, Rosalia Chiu, Ted Esquibel, Holly McCormick, Chuck Jenner, Catalina Castellanos, Lori Goto, Jackie Ogier, Michael Said, Debbie Novelli, Jonna Juul-Hansen, Nathan Pinson, Phil Hutson, Craig Van Engelen, Katie Jackson, Sumina Bhatti, Kristen Fojtik, Sue Lindell, Khani Zulu, MJ Moran, Kristin Kreisel, Lily Lynn, Brendan Doherty, Betsy Smith, Sandy Kerr, Benée Arndt, Michelle Kopp, Patti Simon, Amy Paczosa, Amy Bernhard, Matt Pariseau, Chris Heagerty, Ritch Haenke, Brad Brown, Gigi Jacks McClaskey, Cliff Landers, Kevin Hutchison, Christine Rhode, Debbie Barrerra, John Coake, Lindsey Fenton, Denise DeJardo, Gillian Robb, Kelli McLaughlin, Mark Alexander, Regina Cox, Carolyn Watts, Manny Arce, Kelley Menefee, Tana Campbell, Elena Royal Howard, Sue Markim, Elliott Mitchell, Paige Howell Dahiyat, Barrett Sandefur, Mario Gamez, Shannon Owen, Cheri Martz, Kimberly McLaughlin, Trey Ripple, Penny Moulder, Sharon Burd, Susan Russell, Deanna Garza, Michelle Batte, Reisha Lacey, Shelly Hall, and JC Adams. The Rising Star of the Year award series recognizes a top achiever who has been on the Realty Austin team less than two years and achieved the biggest increase in sales since joining. Realty Austin Southwest Rising Star is Art Fonseca. Art grew his sales 415% in 2018. Realty Austin Northwest Rising Star is Amanda and Amy Team. Amanda and Amy Team grew their sales 230% in 2018. Realty Austin Central Rising Star is Sherry Hendrickson. Sherry grew her sales 131% in 2018. Realty Austin Westlake-Lake Travis Rising Star is Sue Markim. Sue grew her sales 102% in 2018. In addition, the Realty Austin team awarded its team members with Superlative Awards for outstanding performances in unique areas. The Realty Austin Humanitarian Award winner Jeffrey Schnabel was an overachiever this year for his generous charitable contributions to the company’s mission and volunteering his time at Austin Habitat for Humanity, Foundation Communities, and SAFE Touch-a-Truck. Each year the Realty Austin Team Spirit award is given to an agent who embraces the culture, exudes a positive attitude, and is a cheerleader for Realty Austin. Amanda Dudley was overwhelmingly voted by her peers as the 2018 recipient for her infectious spirit. The Realty Austin Golden Hard Hat award recognizes individuals who have gone above and beyond our mission to give back. Jeffrey Schnabel, and Cara Keenan were this year’s recipients who volunteered the most days at the 7th Annual Realty Austin Habitat for Humanity home build. The Realty Austin Heartbeat Award is given to an agent who fully embraces the culture of ‘work hard, play hard and give back’. The company named Cara Keenan as this year’s recipient, noting she does everything with her heart and soul. The Unsung Hero award is bestowed upon individuals who work tirelessly behind the scenes and consistently strive toward making Realty Austin one of the best places to work. The company’s Marketing and Technology Director, Gabe Richter was honored for his behind the scenes dedication to solve problems and conquer our evolving technology landscape since joining the company last year. For the grand finale, the Realty Austin Most Valuable Player award was presented to the individual who contributed to Realty Austin as a whole in a significant way. The company honored Jen Arsaga, who was nominated by overwhleming majority for her unwavering dedication and support each and every day.